Keep destructive carpenter bees away from your home and your own hive. Carpenter bees are naturally attracted to unpainted wood, especially pine. This simple, effective trap has a pine wood top with holes to lure in these bees. Once inside, they're drawn to the light of the attached jar and cannot find their way out. *Note: This item is handmade so dimensions may vary. Carpenter bees are known culprits for burrowing into in wooden structures and making their nests, especially with unpainted or weathered wood (decks, outdoor furniture, eaves, window trim and more). As a result, they can cause structural damage to your home and disturb your own hive. Prevent the damage and disruption with this simple trap. It took awhile before we caught any bee, so you have to be patient. 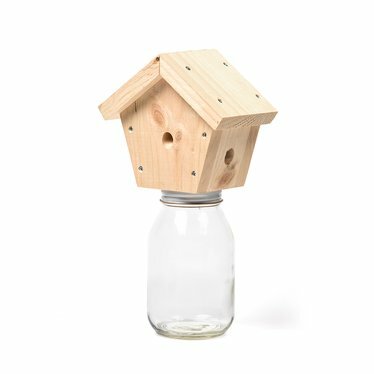 I ordered 2 of these hoping to at least reduce the carpenter bee population by 3 or 4. I've had them up for 2 weeks and nothing. The bees are still active and still buzzing. Have not caught a single bee. Don't waste you money on these. Lehman's says: We're so sorry for your experience. Please give us a call so we can make it right: 1-800-438-5346. Please note: these traps are specifically designed to catch carpenter bees, and other bees will not be attracted to them. built incredibly solid to others I've purchased. glass jars a nice step up from those made with water bottles. very impressed. could have included a hook to hang it on however instead of me having to have to devise something. but give 5 stars. This works great. If you have a carpenter bee problem I highly recommend this product. Ive had this trap 3 days and its caught 7 of them.